BOSTON, MA -- We can check off another week in the Eastern Hockey League (EHL), as the New Hampshire Avalanche and the New Jersey 87s inched their way closer towards clinching First Round byes in the EHL Playoffs. This past week saw action on every day, with tons of great matchups and performances from all across the league. 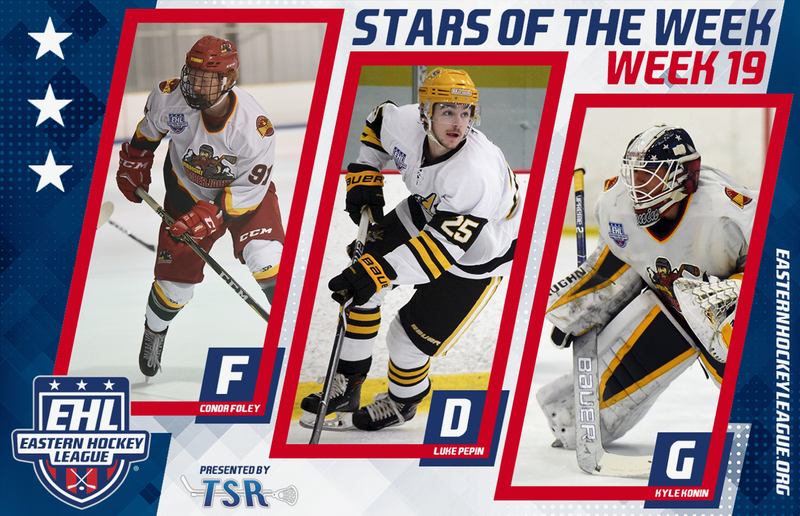 The EHL is pleased to announce that Conor Foley (Vermont Lumberjacks), Luke Pepin (East Coast Wizards), and Kyle Konin (Vermont Lumberjacks) have been named the TSR Hockey Stars of the Week. We keep chugging along with 22 more games this week, as once again, there is at least one game per day tomorrow through Monday. 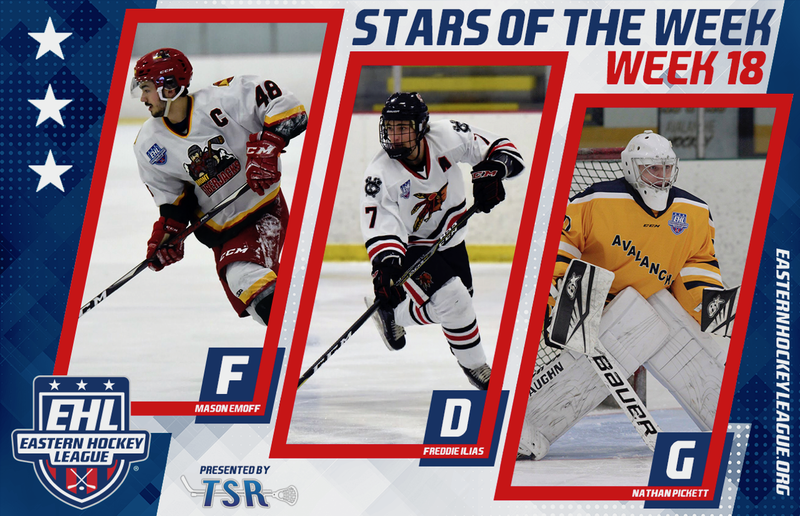 The next set of TSR Hockey Stars of the Week will be released on Monday, February 11th. Remember to catch the #Eshow all season long on HockeyTV. Foley and the Lumberjacks won all three of their games this past week, improving their record up to a perfect 8-0-0 mark since returning from the holiday break. During the current stretch, the offense has been on fire, averaging 5.75 goals per game. That number increased this past week, as Foley and the Lumberjacks found the back of the net 18 total times during their three games. As for the '98 native of Nahant, MA, Foley scored two goals in all three games, and topped things off with a trio of assists on Sunday. For the season, Foley now has 19 points (ten goals, nine assists) in 20 games since joining the Lumberjacks in early November. Vermont has gained tons of ground in the New England Conference standings, and they will try and keep that momentum rolling with seven of their last nine games coming on the road. Pepin and the Wizards took care of business in both of their games this past week, improving their record up to 23-11-1 and taking over the top spot of the South Division in their conference. As for the '99 native of Lee, NH, Pepin continues to lead the way from the blue line, as he added four assists to his name this past week. For the season, Pepin now has 30 points through 34 games, which is already more than double the 12 total points that he tallied in his first year with the Wizards (2017-18 season). Pepin has grown and developed tremendously during his time in the EHL, as earlier this season, he helped make it a weekend to remember for this year's All-Star team. Looking ahead, Pepin and the Wizards hit the ice next in a huge showdown on Thursday against the Philadelphia Little Flyers. We move back up to northern Vermont for our Goaltender of the Week, as Konin and Connor Carbo have helped the Lumberjacks to an impressive active shutout streak that spans over 178 minutes. Included in that stretch are 118 minutes of perfect hockey from Konin. Konin entered this past Thursday's game in relief, and turned aside all 35 shots that the Connecticut RoughRiders sent his way. When the '98 native of West Kingston, RI took over in net, the Lumberjacks were trailing 2-0, but that quickly changed as they mounted a tremendous comeback en route to a 5-2 victory. One shutout performance was then followed up by another, as Konin stopped all 24 shots he faced against the New England Wolves on Saturday. Since joining the Lumberjacks in early January, Konin is been stellar between the pipes. He's has won all five of his starts, all while posting a remarkable 0.83 GAA and .968 save percentage. Up next for the net minder is a matchup with his former team, the New Hampshire Avalanche, on Wednesday at the Ice Den Arena. We'll wrap things up by moving over to the Mid-Atlantic Conference for this week's honorable mention, which goes out to Anthony Shrum of the Philadelphia Revolution. The '99 native of Muskegon, MI was between the pipes for two of his team's three victories this past week, improving his overall record up to 5-0-0 for the season, to go along with a 1.00 GAA and .965 save percentage. Shrum has served as a very valuable backup behind Logan Kramsky this season, as he's truly done his job when his number has been called.